Why Retire to Seattle? Seattle is a breathtakingly beautiful city surrounded by water, to the west lies saltwater Puget Sound; to the east, freshwater Lake Washington; in the middle, Lake Union. 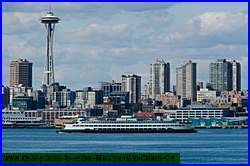 The City of Seattle is located in the State of Washington on Puget Sound, 113 miles south of the U.S.-Canadian border. Seattle is also referred informally as the "Rainy City." The warm temperatures in the summer and mild winters enable year-round outdoor activities. You can expect from cold nights of 25F to over 80F in the summer time. Seattle is a rich and exciting cosmopolitan city. With access to a strong and vibrant economy, affordable housing, and a thrilling culture, Seattle is a perfect place to live, work, retire or raise a family. Hills, lakes and waterways help to separate Seattle's neighborhoods, giving them unique characteristics and appeal. Each area has its own unique businesses, parks and other amenities, usually located within walking distance of homes. These neighborhoods and communities provide the cultural diversity, richness and sophistication of a large city. Yet, the small-town feeling of each area gives its residents a sense of community. The ever popular Farmers Markets provide city dwellers with safe, family-friendly gathering places to go to for the freshest, local fruits and vegetables available. There is something for everyone: biking, golfing, hiking, kayaking, sailing, exploring museums and art galleries, sightseeing by seaplane or van, dining at gourmet restaurants or enjoying small pubs and bistros, casual wine-tasting or more formal wine-make dinner events, exploring beautiful gardens, learning about Native American culture from locals, attending a major sports activity, taking a whale-watching - wildlife excursion, experiencing some of Seattle favorite attractions including the Space Needle and the 100 year old Pike Place Market, enjoying a concert, stage show, opera, symphony, ballet, or local jazz, or simply shopping for that special "something." Whatever your interest, there is plenty to keep you occupy when you retire to Seattle, Washington.